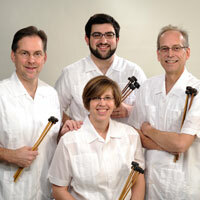 Committed to the authentic performance practice and spirit of the marimba heard throughout Mesoamerica, Marimba Sol de Chiapas has been Kansas City's own Mexican Marimba Ensemble since 1991, maintaining an active schedule of performances, recordings, multicultural workshops, and well over 40 years combined in-school presentation experience. John Currey, Director and an arranger for Marimba Sol de Chiapas, is a freelance percussionist with more than 20 years experience as an in-school presenter and clinician. A member of Tri-Percussion percussion group, John specializes in Modern dance accompaniment, and has toured extensively throughout the US, Mexico, and Western Europe. Teaching credits include at the UMKC Conservatory of Music and Dance, Graceland College, and Pittsburg State University. James Schank is an active teacher/performer in the Kansas City area with numerous performance credits including with the Kansas City Symphony, the KC Lyric Opera, the Chico Symphony, and the Czech National Orchestra. Holding masters degrees in percussion and in conducting, Jim has taught at Simpson College, Kansas City Kansas Community College, and Drake University. Sam Wisman is a versatile drummer/percussionist in Kansas City's thriving creative music scene. In addition to founding his own Lennie Tristano tribute band ‘Crosscurrent’, Sam performs in an eclectic variety of ensembles and settings including jazz, dance, and musical theater. He teaches at the UMKC Community Music & Dance Academy, and at Missouri Southern State University. Laura Lee Crandall is a freelance percussionist performing in a wide variety of styles in the Kansas City area, including orchestral percussion, hand drums, jazz and rock drum set, and solo vibraphone. Laura Lee holds a bachelor in percussion from the Conservatory at UMKC, with dance accompaniment credits for the KC Friends of Alvin Ailey, Johnson County Community College, and the UMKC Conservatory.